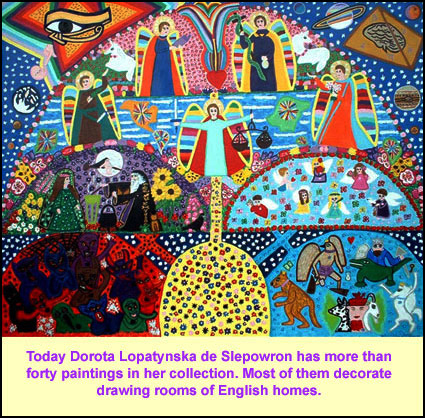 In 2005, "Polish Express", a London magazine, published an article on Dorota, "Colours of Dreams". Then another London magazine, "Polish Times", published another article on her, entitled "Sunflowers". Both the articles discussed evolution and achievements of Dorota Lopatynska-de-Slepowron as a Fine Artist and published photos of her artworks. Polish Express, April 2005, "Colours of dreams"
From the very doorstep of the studio of Dorota Lopatynska de Slepowron, one can feel the positive energy emanating from the paintings of 12 zodiac signs and other magical symbols hanging on the white walls while the smell of wood and canvass fills the air. Every look at the numerous small, fabulously colourful paintings discovers something new. The paintings radiate warmth of its own kind. "There is really something extraordinary in them," says the artist pointing at a small picture of a mystical eye. She continues "The English doctor who purchased a similar painting from me and hung it in her surgery, rang me after a few days and told me that her private life had improved since obtaining the picture and even she had received a pay rise." Is it really possible that a painted canvass artwork can really change life so much? Dorota Lopatynska de Slepowron affirms positively. "It is because hidden in these paintings, there are many signs and symbols of mystical meanings, which carry positive energy. But in any case this is not any black magic and I use only those benign symbols which have associated human race for centuries. I discovered them during my stay in India for several years, by studying books about ancient Egypt and by practising yoga," says the artist. And truly one can find in her pictures themes from the Egyptian cult God Horus, the Egyptian bee - symbol of hard work towards success, symbol of Yan and Ying - the elements of opposite nature, the fusion of which created the whole universe; or two circles with arrows symbolizing man and woman. There are also paintings in which the artist immortalized, for example, her holiday in Corfu while dancing on the beach with her husband and friends. They don't represent a realistic world, these are paintings on canvass of complete metaphors in which every colour and every element has its own meaning. "My most favourite colour is blue as it reminds me of the sky and ocean, orange is another favourite because it gives me energy. I rather avoid dark colours because sometimes they carry with them bad energy," reflects Dorota, "And I am an optimistic person and I know that never to give up when things are bad. I try to convey the same through my paintings. I have noted that most interestingly those who buy my paintings, have similar philosophy like mine. They are usually the people, gentle and patient, and they believe that one can deserve good if only one does good things in life." The creativity of the Austrian artist Gustav Klimt inspires and fascinates her. "I am enchanted by the gold and silver colour of his artwork, they radiate so much love and warmth," says the artist, "One day somebody will discover something similar in my work. It will be really wonderful although I know that our paintings can not be compared." Though the artist doesn't want to be compared with any famous artists, she works for eight to nine months on some of her paintings like other great artists of worldwide fame, sometimes working six to eight hours at a stretch daily. She works hard to bring perfection to every detail because carelessly done details in modern art irritates her. "One can see such lack of completion in some paintings exhibited even in the galleries of Tate Modern," delicately criticizes the artist,"In spite of everything, I have a quiet hope that my paintings will be exhibited there one day." Dorota Lopatynska de Slepowron has about 40 paintings in her collection today. Most of her artwork have decorated the drawing rooms of English homes. Dorota Lopatynska de Slepowron was born in Sopot, Poland. Even at primary school, she achieved artistic success; she won the international competition organized by Great Britain for illustration in Children's Books. Unfortunately, she was refused a place in the prestigious Art School due to her father's active participation in Solidarity movement. However, it did not stop her from painting. However, her most colourful paintings were born after her 3-year-long stay in India with her husband and daughter. Upon returning to Poland, she set up an English Language school in Gdansk. She always used her own illustrations while teaching the children. For over 10 years, the artist who also practises yoga and designs clothes, has been living in London. She exhibited her paintings at Southfields Library in Wandsworth Borough. She also created illustrations for "ABC Children Book". Polish Time, August 2005, "Sunflowers"
�������Today so many of us live in London. They carry within themselves their own experiences, extraordinary histories of their lives making up their own whole worlds. You just ask them and those rare and new worlds are revealed to you. �������I could have met Dorota Lopatynska de Slepowron many, many years ago in Sopot. Who knows, perhaps we went past each other in the streets. While I was lecturing on art at the BWA galleries, she was taking drawing lessons at the nearby Cultural Centre in Sopot. Then many years later, about 2 years ago from today, we could have seen each other again in Southfields at her art exhibition at my local library. That time she was living just round the corner. 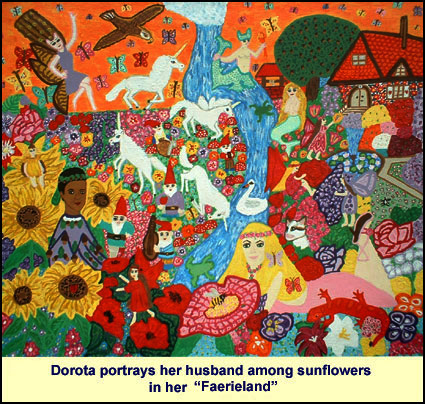 However, I became aware of Dorota and her paintings only a few days ago. I had to make quite a long journey to the other end of London to meet her. Recently she has moved to Tottenham from Southfields with her husband, an engineer from India speaking fluently in Polish, who had his doctorate research work done at the Technical University of Gdansk in Poland. She does not regret the move. Received cordially, I listened to their extraordinary history and had a chance to see her captivating, mysterious paintings. With her extraordinary, poetic comments, Dorota opened before me a whole world of cosmic visions and secrets. Surely I can not write my whole experience in one single article. �������Dorota Lopatynska de Slepowron continues. I try to keep pace with her and attempt to write down her exact words. �������I will tell you what my paintings are about. "There are signs and symbols in disguise in them. They have their own powers with positive energies. Every sign or symbol radiates strengths like a talisman brings luck, happiness and protection. �������One English lady, who purchased a painting from me, has told me that it brought her good luck. She found a better job. 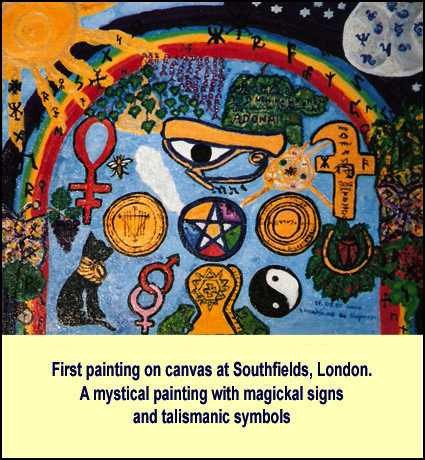 The smaller talisman paintings are sold at �20. I have different paintings. This one is called "The Eye of Horus", it gives protection. Horus is the Egyptian god, an entity of Light. I have used a lot of gold colour here, to underline importance of this artwork. Gustaw Klimt is my inspiration for gold colour. His painting called "Kiss" is my favourite because it represents warmth. �������There are paintings on the theme of zodiac signs. And this one is called "Four-leaf-clover". I've painted it from four hearts. It represents four Elements and brings good luck and happiness. And this one is called "Tik-Tak" - the green spirit of protection. I talk a lot with different people and then I paint. �������I have also many paintings of much bigger size on very complicated theme. It takes me a very long time, sometimes months, to finish them. The knowledge I have acquired is passed on through these paintings. I use many signs and symbols. I have traveled a lot, seen many cultures and traditions, I have learnt not to judge anybody. �������Now it is a new century. People still can't grasp and understand many things. 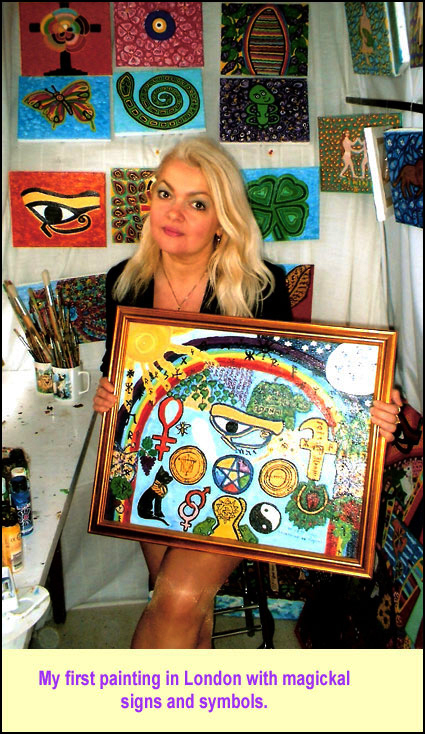 I have tried to reveal those secrets in my paintings "Gateway to God", "Fairieland" or "The Rose of Wicca". I need to tell you about these works on a separate occasion." �������I have been painting since childhood. �������"My first inspiration was "Star" by Edgar Degas. When I was young, I attended Cultural Centre in Sopot and learnt painting. A copy of that artwork hung on the wall at this centre. I would always stop before this painting, watch and think how it was painted - so beautiful like a swan in a blue background. It emitted warmth and love. It was my dream to paint something as beautiful as that one. My teacher noticed that my paintings were full of warmth. For example, if the task was to paint a vase, then it was not enough for me to paint just a vase but a vase with flowers. And everything was finished with minute details. �������Even earlier, while at Grandma's, she would give me colour pencils and picture books for colouring. And she would have hours of peace because I would paint for hours. At school, my favourites were Biology and Chemistry while art classes were the most favourite ones. I took part in art competitions and won many awards. I was already then a Fine Artist but I did not get a place at the Art School. May be because my father was a "Solidarity" activist. �������At that time, I was worried whether my talent would be a waste or develop further? After all, I was an inspiration for many at school. I designed my own clothes. My friends imitated my clothes. I could not resign from this spirit. �������At that time, I met my future husband. Our daughter, Marta, was born. My husband completed his doctorate studies and we returned to Goa in India." �������"It is a fabulous place with very beautiful beaches. My husband worked at the Institute, I was a model and sensation. Everybody was hospitable, open and sincere for us. Almost everyday we were invited somewhere. �But everything was not so great in Goa. There were terrible mosquitoes, the water was not clean. Our daughter began to fall ill. After three and a half years, we decided to return to Poland. It was then 1989 and everything changed there. We set up our English Language Training School in Gdansk and we began teaching. We were also making illuminated signs. Everything was created by hand. I did not have a plotter then. There was a good market because new businesses were being set up regularly, they needed advertising signs and I had the talent and the people liked my work. My signs were approved by the local Council of Gdansk. Our business prospered. But everything was not good. �������The worst thing in Poland was racism. It is very painful to recall those days. I would like to forget them but after 5 years, we had to leave Poland. Our daughter Marta's notebooks were torn apart at school, my husband was told by her teacher not to pick up Marta at school because he created sensations. It was not possible to walk in the parks because we would hear abuses. I could not have time for work at my signs because I had to attend the police stations very frequently. We received anonymous letters with threats to kidnap or kill our Marta. Our signs were damaged, our window glass panes were shattered at our home, somebody threw inside a bottle with fire. That was my country. It hurts when such things happen." �����We left for London in 1995. �������"At first, we lived in Southfields near Wimbledon. It was a nice, peaceful area. I learnt a lot there. I attended many courses, IT and DeskTop Publishing with excellent grades. At the same time, I developed my artistic capabilities. 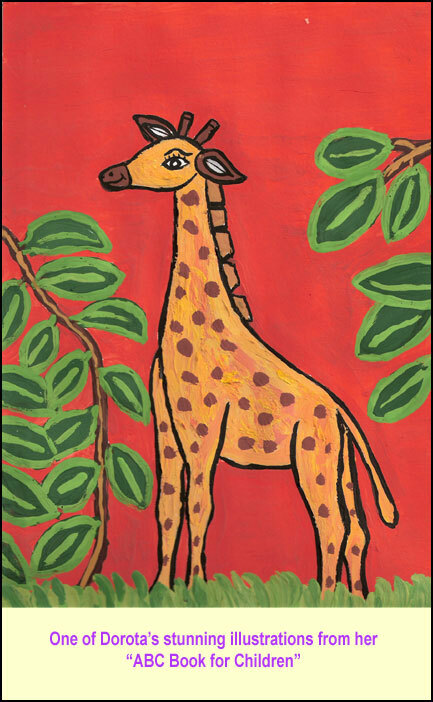 My college teacher noticed my talent when as a thesis, I submitted my own "ABC Book for Children" - wherein I created 26 paintings and then scanned them to publish electronically. Even before that, I created illustrations on computer using a mouse and my teacher was very pleasantly surprised. That time, in 2003 I decided to paint on canvas. My first paintings were created then. Some of them were exhibited at the Southfields library. The local press wrote about me. �������Today I paint here at Tottenham in London. I have my own small studio in the garden. I have planted sunflowers brought from Poland. Sunflowers are the Sun, fulfillment of dreams. There are numerous people all around, very different and interesting. I have interesting talks with them. I also think about other things. I am planning an evening dress collection in medieval style. I hope that there will be again a chance to talk about this." �������I also have the same hope. Thank you for the talk.